The men paid €9,000 in compensation to the victim. The town square in Newcastle where the assault took place. Three men, who admitted beating up a young man after he spoke to a girlfriend of one of his attackers, have avoided jail sentences. The men paid €9,000 in compensation to the victim who was chased and tripped up by the men who then delivered kicks and blows as he lay on the ground. 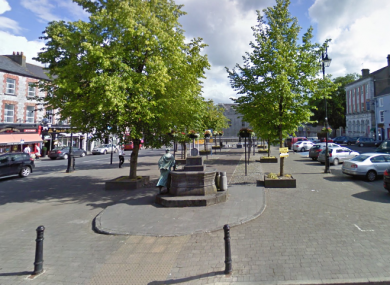 The victim James O’Donnell was left with a broken jaw and broken teeth following the unprovoked vicious assault, which occurred in the town square, Newcastle West, Co Limerick. O’Donnell, an IT graduate, was set upon by the three others after he was seen speaking to a girl in Club Vision nightclub in the town, on 12 July 2014. Judge Tom O’Donnell said he wanted to “send out a strong message against the violent actions” of the defendants. He sentenced them to three years in prison but suspended it provided the be of good behaviour for a three-year period. “This was a cowardly and vicious assault on a victim who had no chance to defend themselves,” the judge said. Cathal O’Brien (22) of The Cross, Ardagh; Shane Kelly (23) of Ballaugh, Abbeyfeale; and Deniss Permanickis (27) from Ballaughbehy, Abbeyfeale, each pleaded guilty to one count of assault causing harm, and to one count of violent disorder. Judge O’Donnell described the attack as “a callous and cowardly outing”. The victim O’Donnell previously told the court in a victim impact statement how he was left with both medical and psychological scars from the night. “I was in hospital for three days; my jaw was broken. I had to have a metal plate inserted and my teeth were wired together,” he said. I was unable to eat solid food for six weeks. Cathal O’Brien tripped up O’Donnell and punched him, before the other two defendants set upon him. Gardaí discovered O’Donnell “lying on the road bleeding from his head and mouth”. “He had a head wound, a broken tooth and bruising to his arms,” Michael Collins, prosecuting counsel, said. Judge O’Donnell noted the “deep remorse” shown by the three defendants. “It was an attack on an innocent person who was extremely exposed, unaccompanied,” the judge said. I don’t want to be (seen) as allowing these three young men to buy their way out of these matters. Email “"A cowardly and vicious assault" - 3 men avoid jail after attacking man outside nightclub ”. Feedback on “"A cowardly and vicious assault" - 3 men avoid jail after attacking man outside nightclub ”.